The personal web page has returned as an important medium, without the need for programming skills or design savvy. These days, people are “blogging” instead of HTML tagging, and they are using mobile phones as well as PCs to publish their content. Has the home page finally found its ideal form? When the World Wide Web entered the mainstream in the mid-nineties, personal home pages became a must for burgeoning netizens. Many Net users made rudimentary websites, offering pictures of themselves, family and friends, links to other websites, and guest books where visitors could sign their names and write messages. There are still a great many personal home pages on the web, but in the last few years, millions of people have started turning to a new publishing technique – simpler, faster, and less design-focused than the HTML-based pages that dominated the early days of the Web. Blogging is short for weblogging – and the word is simultaneously a noun, a verb, and any other type you can think of – a real Internet buzzword phenomenon. 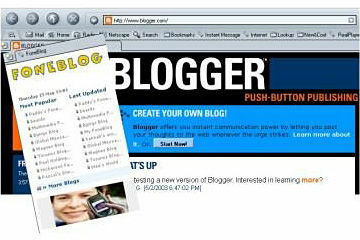 The first weblog is commonly attributed to Tim Berners-Lee, the scientist who invented the Web in 1991. He created a page with references to other websites, keeping it updated as new sites became available. Weblogs are like other logs – such as a captain’s log aboard as steam ship – in that they are used to record events, to catalog the life of it’s owner. But they also extend beyond this mere organization of events; they can be often-updated sites that point to articles elsewhere on the web, often with comments, and to on-site articles. A weblog is kind of a continual tour, and the blogger is your human guide who you get to knowas you travel. There are millions of blogs on the web, each develops an audience, and you will find camaraderie and animosity, and all kind sof politics between people who run weblogs. They link to each other, they reference each other, and they connect in all kinds of structures. Blogs are popular for several obvious reasons. The publishing process is ridiculously simple. You go to a free blog service provider, such as blogger.com, and register your name, e-mail address, username, and chosen password. After this you decide on a design template, and voilá: Instant homepage! The publishing interface is ultra-simple as well. Since the presentation is generated through pre-defined templates, all the blogger has to do is to enter text in a predefined field in the blog editor, add an image, a video file, or a few links, and click “publish”. This ease of use is a very important reason the blogging phenomenon has spread so rapidly. Publishing is not limited to the PC platform either: Foneblogs are blogs that are published through mobile phones, by SMS or MMS. If you have a modern cell phone with a camera, you can take a picture with it, send it to a phone number that is hooked up to an SMS or MMS server, and publish it directly on your foneblog. The first weblog is commonly attributed to Tim Berners-Lee, the scientist who invented the Web in 1991. He created a page with references to other websites, keeping it updated as new sites became available. Today blogs cover a broad range of topics and styles. The most common form is the personal diary. Blogging has replaced the offline book of entries for a large portion of western youths. The difference, of course, is that this diary is open to the world, whereas the original kind is all about secrecy. As with the original diary in book form, this type of blog is dominated by girls and young women. Kari Hamnes is a research scientist in Telenor’s research division. She thinks that blogging could be an ideal way for many women to go online. Blogging is not just limited to the personal sphere. Researchers are creating blogs with shared access, distributing ideas, documenting the progression of research projects, and pooling references and research material. System developers and programmers are using blogs in much the same fashion. Keeping tabs on projects, and sharing scripts and bits of code. Among the most interesting uses of blogging so far is the independent and communal news agency Demand Media, which publishes through a blog service. The agency gathered attention during the war in Iraq when it became a source for independent coverage. It works by allowing anybody with a video clip and Internet access to blog the clip to a server, where the agency’s moderators – and some of its users – filter it through a set of criteria to determine if it has journalistic merit, and post it on the blog if it’s deemed worthy. It is a sprawling news medium, with less organization and more versatility than conventional agencies, but it is a good place to go to find independent coverage of international news stories. Just imagine this: If Demand Media had existed on September 11th 2001, everybody with a video camera could have posted their clips here, widening the coverage considerably. Recently, a story involving blogging has created much publicity in the U.S. It involves a journal – the blog of a woman who claims to be the heiress to a wealthy family, on the run and hiding. “On March 2, 2003, at 4:12 p.m., I disappeared,” the journal begins. “My name is Isabella V. I’m twenty-something, and I am an international fugitive.” It goes on to describe a story that could be taken from the pages of a Robert Ludlum story. Isabella V. claims to be on the run from her family to escape an arranged marriage. The story evolves day for day. Among its fantastic elements are a father, described as a sort of mafia don, with connections in high places; Mr. Blond, a private detective following her across the globe; island-hopping in the Caribbean; fake passports, trust funds, and private schools. The debate rages on whether the story is real or just a hoax. And although most people tend toward the latter explanation, some tantalizing clues seem to verify parts of Isabella’s story. And, as some hold it, who really cares if it’s a good read? Predictably, the blogging phenomenon is generating new business models that may prove profitable for enterprising publishers. One such businessman is Mark Denton, who is taking nanopublishing to new levels. His idea is simple: Step 1: Come up with an idea for a weblog. 2: Find a designer to make the design template. 3: Hire an editor and pay him a few thousand bucks a month to write it. 4: Pocket a small profit from affiliate sales and banner ads. Step 5: Repeat steps 1 through 4 as many times as you like. If you think you recognize this business model, it is because it is a miniaturized version of the idea behind most portals, newspapers and online publications of all sorts – the idea that lost everybody money when advertising revenue failed to reach the levels imagined by media houses worldwide. The cost of doing this on a conventional web platform has simply been too high. Denton eliminates most of these costs by using blogs as his medium, and success depends on two key factors: One: Find topics that have broad consumer interest, and two: Make a lot of blogs. This could very well be something the big media houses should look into.